Jill M. Barr (nee Martindale), age 47, passed away on Thursday, March 1, 2018. Jill was a beloved wife of twenty years to Robert Douglas Barr, and loving mother to Helen Rose, Thomas Elliot and Emily Rae. Her caring siblings were Katherine and Jay Dobrinska, and Amy Martindale. Jill was devoted to Robert's parents Thomas and Suzan Barr, and Robert's siblings Martin and Alicia Barr, and Jennifer and Patrick Dehaan. She leaves behind many cherished nieces and nephews. Born in Livonia, Michigan, Jill was raised throughout central Michigan, spending her high school years in Roscommon, Michigan, on the shores of the Au Sable River. From an early age, Jill excelled at singing, and traveled throughout Europe with the Blue Lake Choir in the summer of 1987. An avid skier in her youth, Jill skied with the Roscommon school team. One of her favorite places to ski was Boyne Mountain, Michigan. Jill was a Michigan Wolverine fan since birth. The Barr family still vacations in Northern Michigan, spending memorable summer weeks on the Sleeping Bear Dunes National Lakeshore. Jill attended Albion College in Albion, Michigan, where she majored in English and developed a lifelong interest in the works of Shakespeare and Chaucer. She sang in the College Choir and Briton Singers, in addition to playing trumpet in the British Eighth Marching Band and the Symphonic Band. Jill also performed in college theater productions of Brigadoon and The Mikado. She was a devoted member of the Kappa Delta and Sigma Alpha Iota sororities. A memorable "relaxing" class for Jill was canoeing, the skills from which were used later on many family canoe trips. Immediately after graduating with a Bachelor of Arts degree in 1993, Jill performed with the Albion College music department in a tour of Germany, Switzerland, Italy and Austria, where she developed a close relationship with her future husband, Robert. After residing for three years in the Hyde Park neighborhood of Chicago, Jill moved to Cleveland Heights in 1996. She worked in various administrative roles at the Cleveland law firms of Taft, Stettinius & Hollister LLP, and Frantz Ward LLP. From her days writing college papers, Jill retained a sharp grasp of the written and spoken English language, correcting many who are not often corrected. Following a two-year engagement, in June of 1998 Jill and Robert were married at St. John's Episcopal Church in Saginaw Michigan, the lifelong church of her grandmother Helen Hempstead. Jill and Robert first settled as a married couple in the Coventry neighborhood of Cleveland Heights, and in 2001 moved into their first and only home on Edgerton Road in University Heights. Since their arrival on Edgerton Road, Jill and Robert have been active members of the neighborhood, often hosting the annual street block party. Their prayers were answered with the arrival of three children. Helen Rose, their first daughter, was born in January of 2004; Thomas Elliot joined the family in July of 2005; and Emily Rae completed the family in April of 2008. All were baptized in Church of the Saviour. Shortly after Helen was born, the Barr family officially joined the Church as members. Jill immediately became a member of the Chancel Choir. She later joined Bells of the Saviour, and was active in all facets of music at the Church. The Children's Ministry was also a focus of Jill's talents, particularly Vacation Bible School (VBS) for many years. Every June, Jill worked hours into the night in advance of VBS, to ensure every detail was covered. One of those years, Jill played the lead character on the VBS theater stage. All three of the Barr children attended the Cooperative Nursery School at Church of the Saviour, and Jill served as president of the Cooperative for two years. 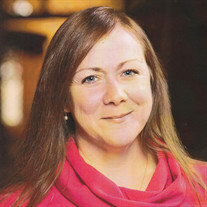 Recently, Jill was the Special Projects Coordinator at Church of the Saviour, overseeing several significant projects. She became the face of the Church's Upward Basketball League, serving as its administrator. Jill was present for almost every training session, orientation, practice, and game. She was truly devoted to the players, teams, coaches, staff, and parents. Additionally, Jill was named editor of the Church newsletter The Chimes in 2017. She was aware of almost all happenings and meetings at the Church. A fierce advocate of public schools, Jill was often seen at Board of Education and other community meetings, lending her strong support for schools in the Cleveland Heights-University Heights School District. Jill recruited and coordinated tutors from John Carroll University who continue to help students at Canterbury Elementary School in Cleveland Heights, where all of the Barr children have attended. Recently, the term "fierce" came to define Jill's determined spirit, and her will to conquer the recent devastating illness. Jill was an intensely loyal, compassionate, loving, forgiving, and dedicated friend and mother. She fought for people, and for what was right. Jill was fierce. Donations in Jill's name may be made to Church of the Saviour Foundation, 2537 Lee Road, Cleveland Heights, Ohio 44118, or to WCPN "Ideastream" at 1375 Euclid Avenue, Cleveland, Ohio 44115 (wcpn.org). A Funeral Service for Jill will be held in the Sanctuary at Church of the Saviour on Friday, March 9 at 11 a.m., with a luncheon to follow in the Great Hall.